Divides the output frame into slices, where each slice receives a different frame from the source clip. An example use of this effect might be to make a turning object twist into a helix shape instead of rigidly rotating. The slices are oriented depending on Slice Direction, and receive relative frame numbers between plus and minus half of Slice Number. For example if the current frame number is 30, Slice Direction is -90 degrees, Slice Number is 12, and Frame Offset is 0, the result will consist of horizontal slices containing approximately frames 30-6 to 30+6 from bottom to top. 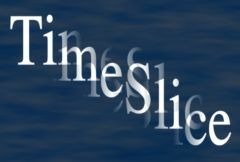 In the Sapphire Time effects submenu. Mask: Defaults to None. Interpolate between the result and the Source input. White areas use the result of the effect. Black areas use the Source clip. Slice Direction: Default: 90, Range: any. The orientation of the slices, in degrees. If this is 0 the slices will go from left to right. If it is 90 they will go from top to bottom. This parameter can be adjusted using the Slice Widget. Slice Number: Default: 12, Range: 1 or greater. The number of time slices to slice the frame into. This parameter can be adjusted using the Slice Widget. Frame Offset: Default: 0, Range: any. Shifts all frame numbers in time that the slices receive. This parameter can be adjusted using the Slice Widget. Interp Frames: Check-box, Default: off. Selects the method to use for non-integer frame number references. If disabled, the nearest integer frame number is used with no interpolation, which usually gives visible edges between the time slices. If enabled, a weighted interpolation is performed between the two nearest integer frame numbers, which smooths the results between the time slices. Show Slice: Check-box, Default: on. Turns on or off the screen user interface for adjusting the Slice Direction, Slice Number, and Frame Offset parameters. This widget visually shows the single slice where the result equals the current frame of the source.This parameter only appears on AE and Premiere, where on-screen widgets are supported.